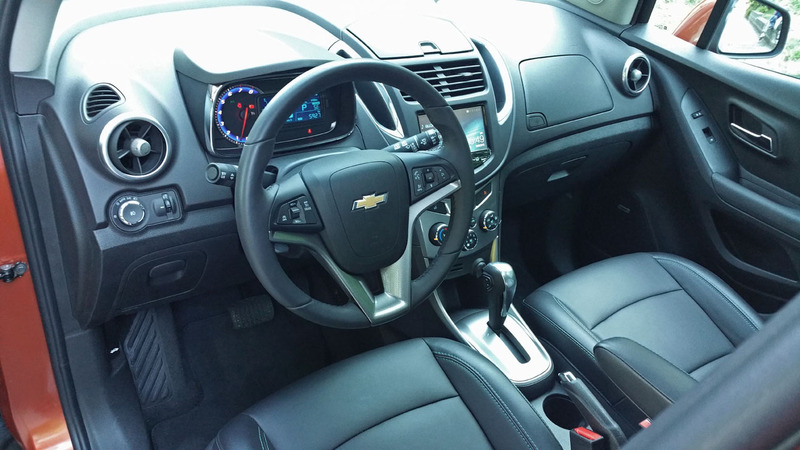 north of the 49th a couple of years ahead of Chevy’s largest and most important market allowed it to gain some traction in a safe environment. and City Jetta (reworked older generation models sold exclusively to Canadian entry-level buyers), while older models that never made it stateside include the Ford Cortina and Hyundai Pony, plus the Lada Signet, Samara and Niva. I’ve probably missed a few, but you get the idea. 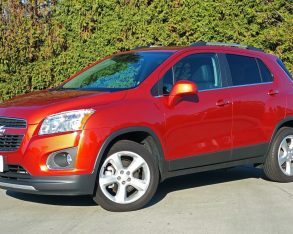 Despite this lengthy list GM has by far been the leader in offering exclusive rides to we Canadians with small car nameplates like Optra, Optra5 and Orlando from Chevrolet, Tracker from GMC, Wave and Pursuit from Pontiac, plus the ES, GT, Sunfire and Sunrunner from Asüna (Canada’s version of Geo), Optima from Passport, all hailing from the General’s relationship with and eventual ownership of South Korean brand Daewoo, now known as GMDAT. debuting its then-new Beat, Groove and Trax concepts at the New York auto show in 2007, holding an online vote during the event via a designated website to decide which design would get built and which ones got the axe. The Beat won and soon became the third-generation Daewoo Spark with few revisions, a version of which has been sold in the US and Canada with a bowtie on its grille since the summer of 2012. 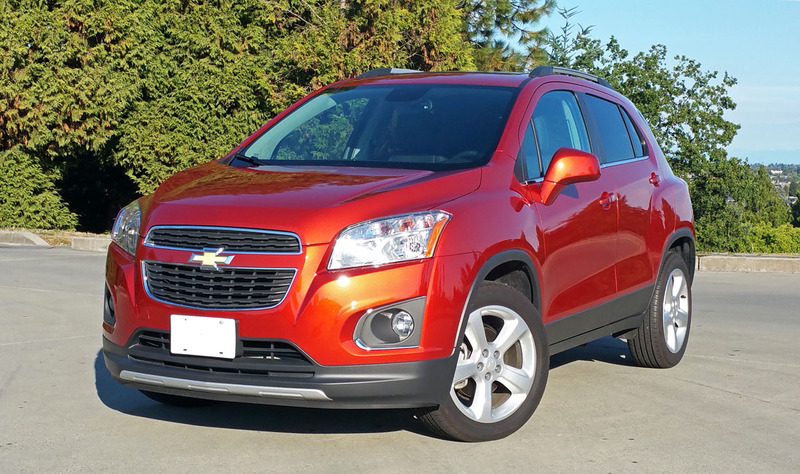 Despite the name, the concept Trax had little if anything in common with the Gamma II platform-based road-going model, but Chevy kept the catchy name and is now hoping it’ll stick in the US as well as it’s been accepted here. down the road last year, while its YTD 2015 sales are still fairly good at 5,845 deliveries as of September’s close. 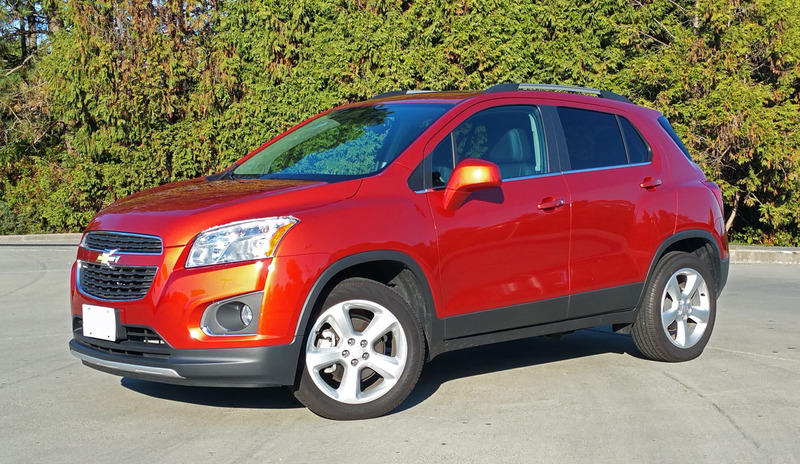 Its YTD sales in the US aren’t quite as strong per capita at 43,051 units, but considering the Spark only managed 27,839 sales during this same nine-month period it’s pretty clear that GM’s US division chose the wrong Korean model to import. Renegade, and Fiat 500X. 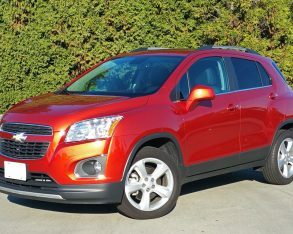 That’s a deluge of new rivals for buyers to mix their way through, but nevertheless the Trax remains in the number one sales spot. I can give you a number of reasons why I think it’s successful, but I’m not going to include styling as its topmost attribute. It’s certainly not a detractor, the little Trax wearing Chevy’s tough truck-like chrome-rimmed bisected grille well, but every time I see it go by from profile the word “stubby” comes to mind. Its overall height is considerable and length not so much; this being the only time I can remember having tall and short enter the same thought, but there you have it. 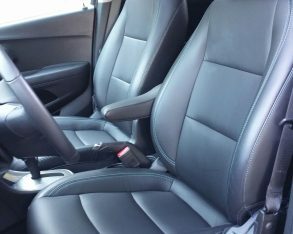 However you want to see it, nobody will argue that it’s sleek, but then again it couldn’t be considered fat either, it’s just too small for that. Either way it’s now found a place in North America’s collective heart and into its garages, so it’s likable enough. fogs featuring chrome and matte-black bezels plus a wide matte-black front lip spoiler with attractive satin-silver metallic garnish at centre. It looks rugged in an impish way, while additional black cladding provides a bit of go-anywhere attitude to its profile and rear quarters. 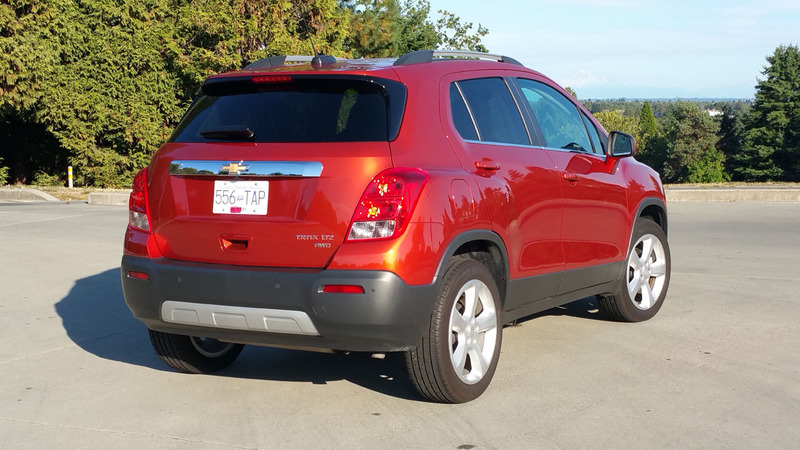 Chevy splashes some chrome trim along the windows and roof rails for a bit of class, the LTZ’s rear getting an even larger dollop of bright metal overtop the license plate and a thicker slab of aluminum-look metallic trim on the lower bumper. I have to admit that it’s a pretty good-looking little cute ute that’s made a whole lot ballsier thanks to 18-inch five-spoke alloys on 215/55R18 Continental ContiProContact all-seasons. 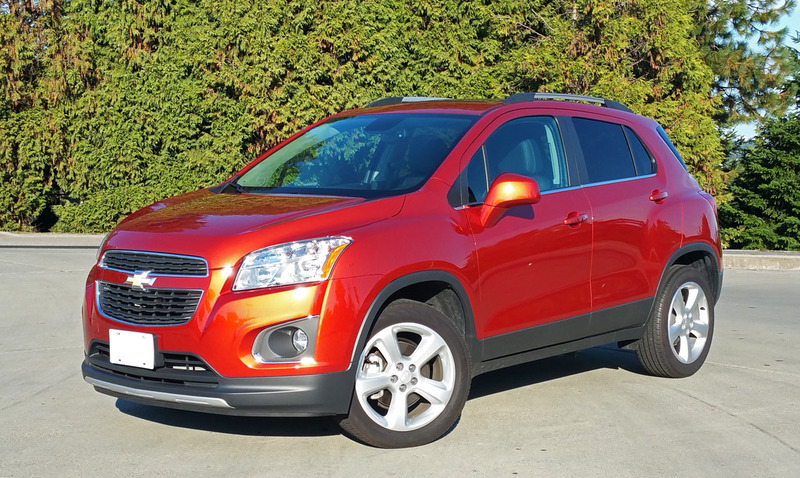 road tires that provide a decent balance of comfort and cornering prowess, just like the Trax itself. Really, it might look tall and narrow, but it takes to the road with a level of confidence I didn’t expect, while its comfortable ride is another bonus that no doubt pleases its owners. 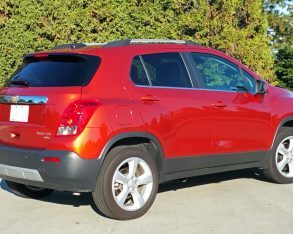 The Trax’s underpinnings are the usual front struts and rear torsion beam, which work very well in this type of vehicle and provide more interior roominess than an independent rear suspension would, plus lower cost of manufacture, money that GM was able to put into its feisty little turbocharged 1.4-litre four-cylinder that’s good for a very energetic 138 horsepower and 148 lb-ft of torque. sometimes unreliable dual-clutch designs can rest assured that this well-proven gearbox will get them to work, home and then on vacation in one piece, while it only needs regular unleaded to achieve a five-cycle EnerGuide rating of 9.1 L/100km city, 6.9 highway and 8.1 combined with its standard six-speed manual and FWD, 9.2 city, 7.0 highway and 8.2 combined with the auto and FWD, or 9.7 city, 7.6 highway and 8.7 combined with its as-tested autobox and AWD. Not bad at all. executed with royal blue backlit accents around the tachometer and a big blue LCD readout for the speedometer, fuel gauge and other meters. 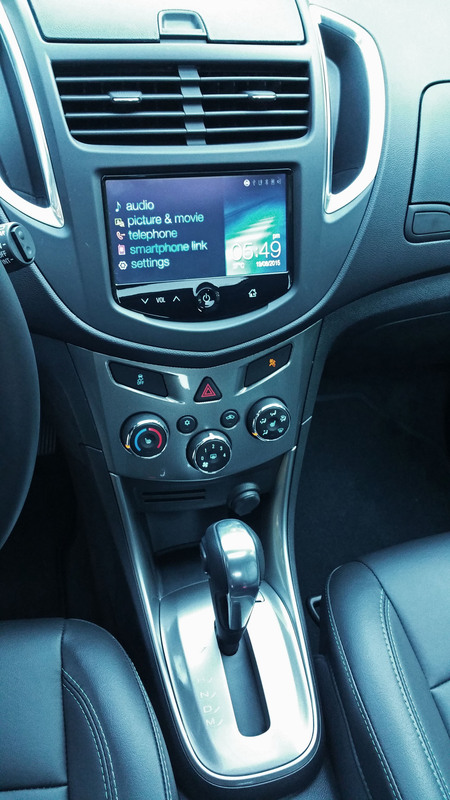 Over on the centre stack the infotainment system is also superb for this class, with excellent full-colour high-resolution graphics and a substantive seven-inch size, plus I really like the way it integrates with smart phones. 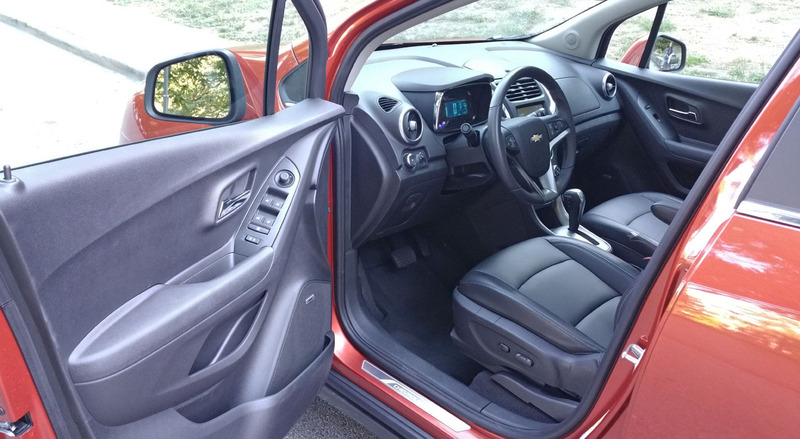 All radio functions can be found within, or via the Trax’s high-quality steering wheel switchgear, while just below is a three-dial combination of HVAC controls that are very well made with rubberized rims no less. 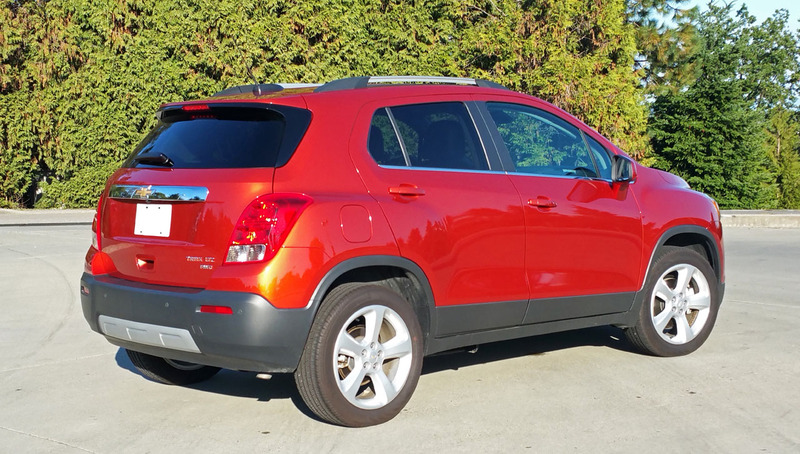 Most buyers like that the Trax lifts them up higher than the usual compact hatchback, its subcompact SUV status making sure a tall ride is part of the package. 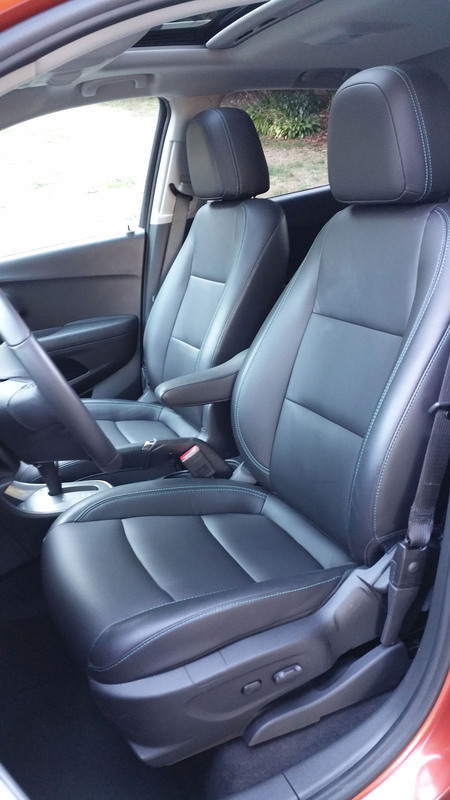 This gives great visibility all-round, while its front seats are very comfortable and surprisingly roomy. 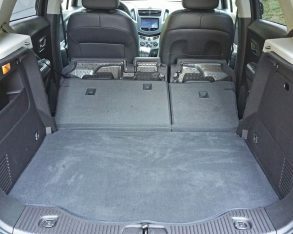 In fact, I don’t think you’ll find many that won’t be able to squeeze into this tall soft-roader, air space aplenty between heads and roofliner, while rear seat accommodations offer ample legroom as well, although I wouldn’t try and cram three large-bodied teens side-by-side for a long road trip or a brawl might break out. 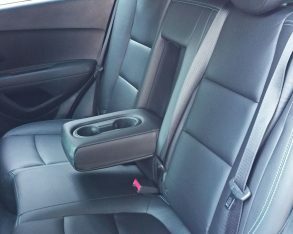 Chevy fits a flip-down centre armrest with dual cupholders that’s useful when two are in back, while those 60/40 split-folding rear seatbacks drop totally flat by flipping the lower cushions up against the front seatbacks first, and then pushing the rear ones into the floor. 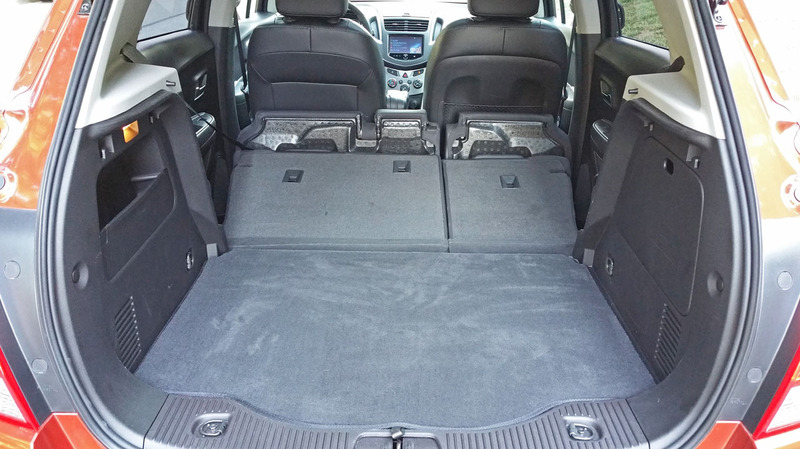 It opens up a massive cavern of cargo space measuring 1,371 litres (48.4 cubic feet), which has to be one of Trax owners’ favourite qualities overall. 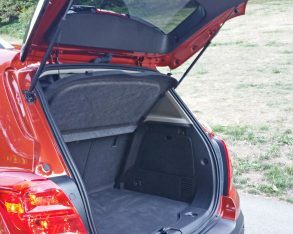 Even with the rear seats in use there’s a sizable 530 litres (18.7 cubic feet) to work with, which is more than the average mid-size sedan’s trunk space. 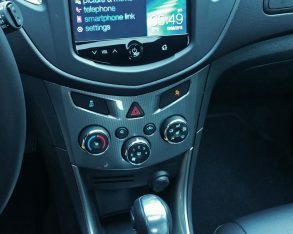 AWD variants, emergency brake assist and hill start assist, not to mention OnStar telematics, an electronic immobilizer to deter theft, and last but hardly least all six of the usual airbags as well as a driver’s knee blocker and rear outboard seat-mounted side-impact airbags, the latter almost never seen in this class but very welcome in a small vehicle. 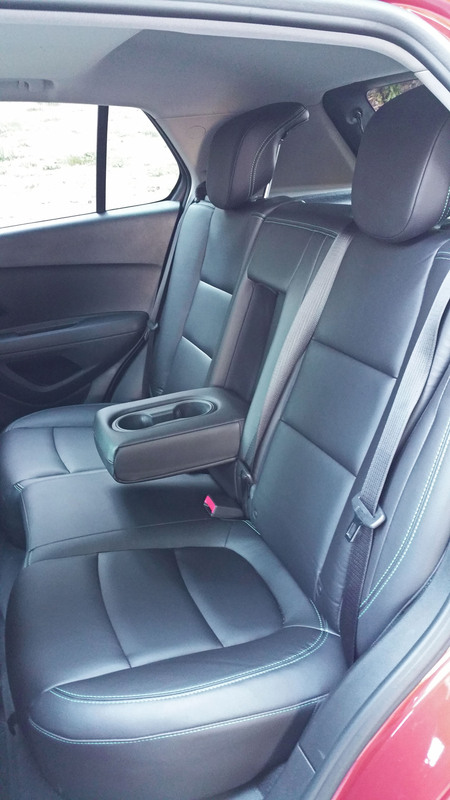 These features earned it a Top Safety Pick from the IIHS and a 5-star rating from the NHTSA. Impressive. 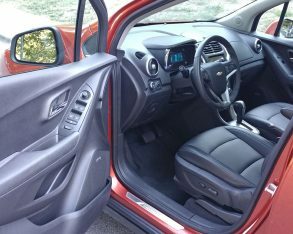 port, Bluetooth, OnStar with Wi-Fi hotspot capability, cloth upholstery, a cargo cover, a storage tray under the cargo area, and a lot more. 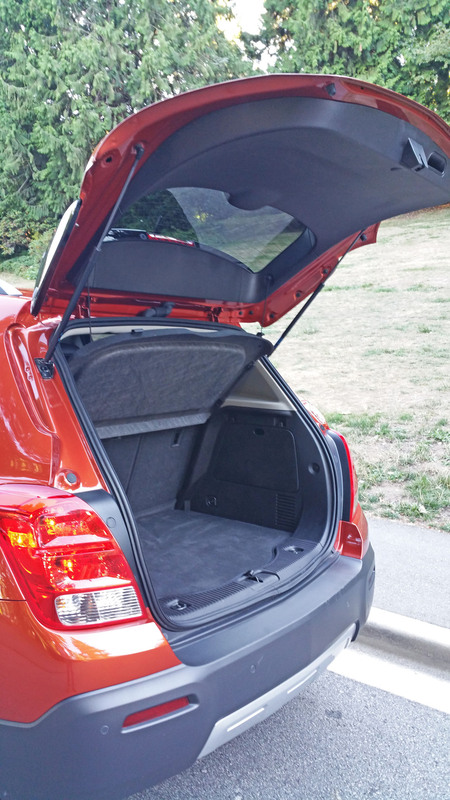 The price for this well-equipped little CUV is just $19,130, which is no doubt another reason it’s such a hot seller. amp and satellite radio, plus rear parking sonar. 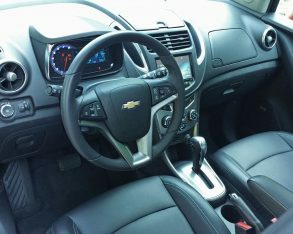 The 18-inch rims, fog lamps and some of the exterior chrome bits that I noted before come standard with my $28,600 LTZ tester, as does an auto-dimming rearview mirror, leatherette upholstery, and heatable front seats. 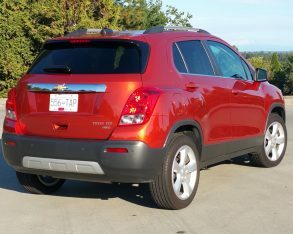 My tester also featured an optional powered glass sunroof, while LTZ options also include a cargo net and cargo load tray. 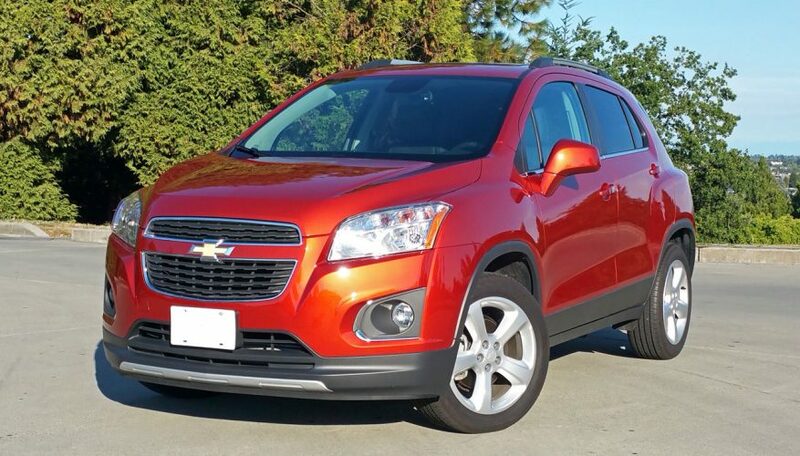 After a week of enjoyable service from Chevy’s Trax I can honestly say it scores way above expectations, reason enough for it to sell as well as it does and making it more than worthy of becoming one of my recommended rides.